This article explains the Ethical Leadership in a practical way. After reading it, you will understand the basics of this powerful leadership style and philosophy. When we talk about Ethical Leadership, it’s wise to first ask what ethics is. If you would ask this question to 100 philosophers, there would be 100 different answers. That shows that ethics is almost impossible to put into in words. In ancient Greek times and the world’s religions, ethical behaviour is about knowing what is right and living in accordance with that. Ethics are based on a number of social norms and/or logically related philosophical principles. Ethical leadership is about respect, trust, honesty, openness and compassion. Ethical Leadership is about integrity in the workplace, but is also more than only acting with integrity. It is about the ability of the leader to promote integrity in the organisation. Ethical leadership is only effective if managers are seen as role models by their employees and regularly explicitly discuss questions of integrity with their employees. The leader needs to pro-actively support the formal integrity policy and consistently and visibly intervene when employees do not adhere to it. Ethical Leadership has many positive effects. Research has shown that ethical leaders deliver an essential contribution to the integrity of their organisation. It increases the feeling of safety of all employees, improves the organisational culture and reduces incidents of conflict. It also has a positive impact on the contentedness, motivation, health and performance of employees. The ethical leader has qualities that serve as an example. When an ethical leader acts appropriately, that is noticed and remembered by those around him. Through ethical, honest and selfless behaviour to his employees, the ethical leader earns respect and they will evaluate him positively and follow him in his actions. As an ethical leader, it is important to teach colleagues about ethics, especially in cases where they are confronted with an ethical problem in the workplace. Successful ethical leaders generally communicate well. It is the ethical leader’s task to communicate with all team members in the same way, and not to make any distinctions based on personal preferences. Each conversation needs to take place in a positive environment, which benefits the team and creates the foundation for mutual trust. Maintaining a positive work environment is an important responsibility of the ethical leader. He serves as a role model and is well-placed to be able to communicate with them and motivate them. The ethical leader empowers a team and is able to engage the entire team in various issues and facilitate cooperation. In general, the morale in a team is higher when people get along with each other. The ethical leader has a big influence on this and calls them on it when his team members do not act in an integral or respectful way towards another. The importance of a positive attitude in the workplace environment has a lot to do with improving of the general health of the organisation. When people treat each other with respect and value each other’s opinions, this will trickle down through the entire organisation. Ethical leadership ensures that an organisation is a place where people feel safe and trusted, can grow personally, build friendships and contribute to the general organisational goals. 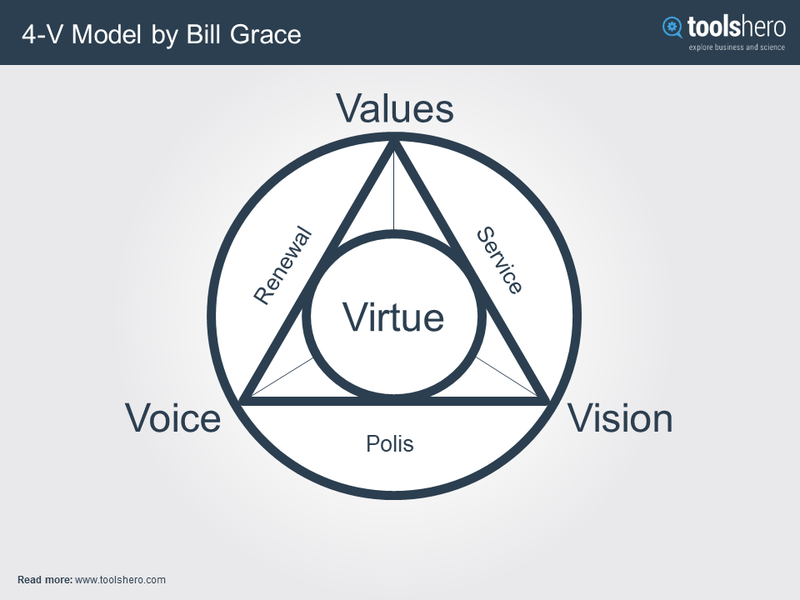 In order to express ethical leadership, Bill Grace, one of the founders of the Center for Ethical Leadership, developed the 4-V model. This model helps to align internal beliefs and values with external behaviour and actions for the common good. The letters represent Values, Vision, Voice, and Virtue. These are features that help to create a strong ethical leader. It is important that the ethical leader understands these core values in all aspects of life and implements them in the organisation. The model provides a framework that matches the internal factors (beliefs and values) with external beliefs (behaviours, actions), serving the common good. According to this model, leaders make the difference. The first step begins with self-knowledge and the discovery of one’s own core values. Only then can the ethical leader share his core values with others and connect himself to society in doing so. In order to develop good Ethical Leadership, the leader needs to first go in search of his own core values. Here it is about the leader’s ability to implement his actions in such a way that they lead to a certain goal (vision). The ethical leader must have a voice, in order to formulate the vision for others and to make it clear in a way that motivates them to act. Ethical leaders are role models because of their virtuous behaviour and will strive to do the right things and act appropriately. 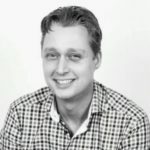 Service connects the vision to the values. From the values, the vision will be revealed through the service. Polis stands for politics. It indicates that an organisation deals with the art of politics when the vision has to be communicated to public groups. Renewal stands for innovation. Although the voice can be expressed in different ways, the ethical leader will have to regularly consider whether actions are in accordance with values and vision. What do you think? Is Ethical Leadership and the 4-V model applicable in today’s businesses and organizations? Do you recognize the practical explanation or do you have any additions? What are your success factors for practising good leadership? I read the article , it’s educative based on distinctive and positive principles of leadership model. I would be happy to read more on the subject of ethical leadership . Thank you for your comment, Abdul. An ethical leader is the one who does not know how to behave unethically. Ethical leadership is tricky. It is hard to define. It is about treating customers fairly and equitably. The front-runner needs to have all the leadership competencies required for being ethical in his field. Besides that, the chairperson needs to honor and penalize based not only on the consequences but also on the approaches implemented to accomplish the ambitions. Thank you for your comment, Monte.